Today is a slower-paced schedule, which is a welcome change. And we don’t have to go into any damn Hindu temples. I’m kidding, of course, as the temples have been great. But a day off from Lord Shiva feels welcome to this Jewish guy. We have stayed at some terrific hotels, and this one, set in a magnificent old mansion, is elegant and distinctive, with rooms on two floors around an open atrium. 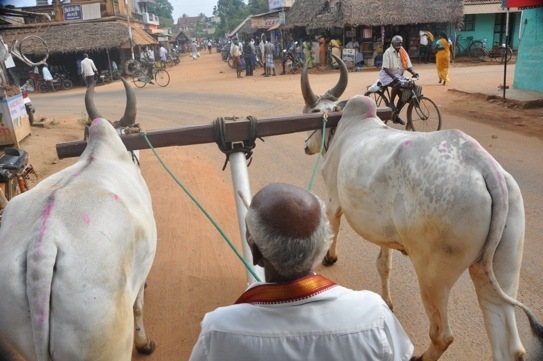 We travel around Chettinad by ox-drawn cart, a leisurely and great way to do it (except when you come face to face with oncoming motorized traffic). It’s a sign of the times that towards the end of our ride the old ox-cart driver receives a call on his cell phone. The Chettinad region at one time represented the wealth of Tamil Nadu. The many villages were once the homes of fabulously wealthy merchant families known as the Chettiars. Today it is an area of mostly deserted magnificent mansions. 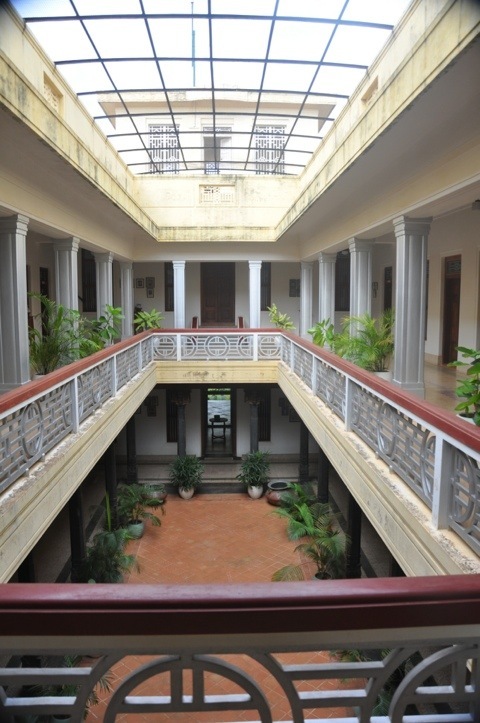 Just one of the Chettiar houses used 300 tons of satinwood and Burma teak in its construction. One of the specialties of these houses is the woodcarving especially on the doors. 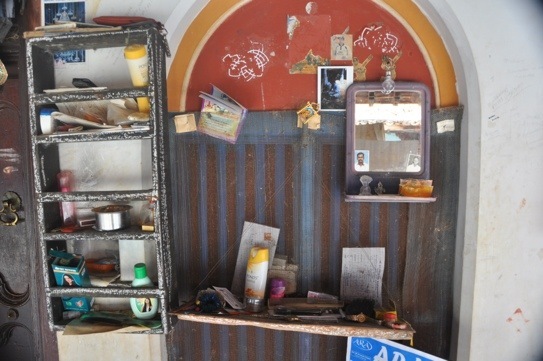 We stopped to visit one of the run-down, occupied mansions and saw the inside and some of its inhabitants. 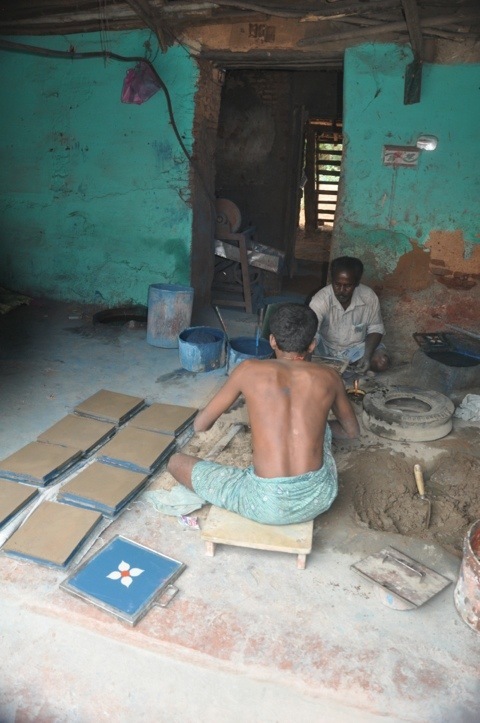 We forsook our oxen for the minibus, and drove to a place where beautiful tiles are being made out of cement. 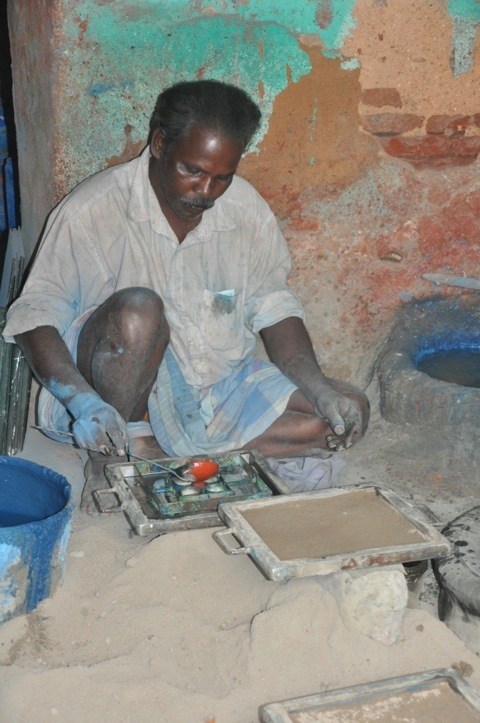 We saw the whole process, which involves putting a piece of glass into a metal frame, pouring paint on the glass, using forms to create a design, sprinkling on dry cement, pouring wet cement into the frame and smoothing it out, drying it for a day, submerging it in water for two days to strengthen the cement and, finally, allowing it all to dry for five days and removing the glass. We’ve seen demonstrations of many crafts and arts around the world, but this one was a first for two reasons: we actually understood it and nobody tried to sell us anything afterwards. The end product is quite wonderful. 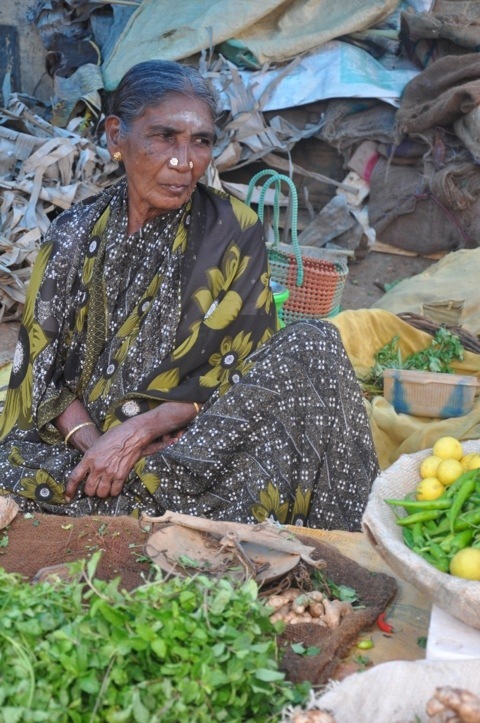 After the demonstration, we walked around a nearby vegetable market. From there, we drove to another hotel, housed in a large mansion, for an excellent traditional South Indian Tali lunch, composed of many different dishes spread on a banana leaf and eaten with your hands. The owner of the home chatted amiably with us. This hotel was also lovely, but not quite as nice as the one we stayed in. We set out for Madurai, stopping at a town to walk through an antique market, where Karen and Steve bought a brass knocker for their front door. 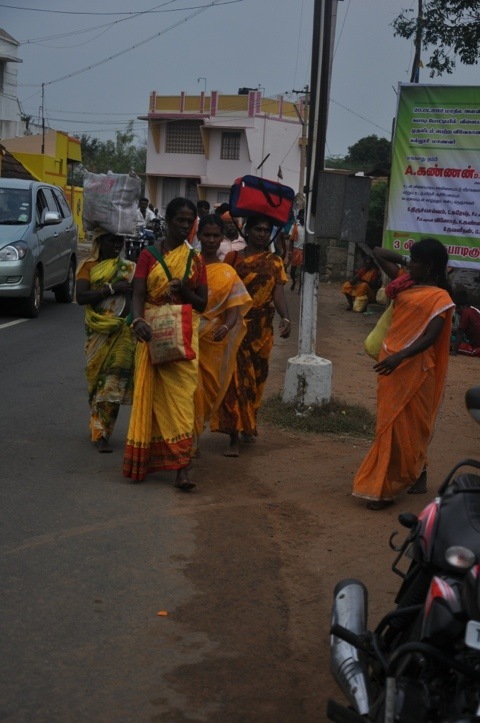 Along the road today we have seen large numbers of pilgrims who are walking to a temple some 200 kilometers away. The walk will take them five days, and they will make an offering when they arrive. web api security . Jay tells us that a very large pilgrimage in Kerala, an area we will visit later, attracted 20,000,000 people over a month and a half period, and raised over 180,000,000 rupees in contributions. We drive on through Madurai, the second largest Tamil city at 1.4 million people, and on to The Gateway Hotel, situated on a mountain top, high above Madurai. We have a lovely view, with a large terrace that overlooks the city. We relax in room, then walk up to the restaurant for a pretty good dinner with pretty lousy service. Loving your reports and photos, as we eat our fast food on the road! Just like what happened in England. 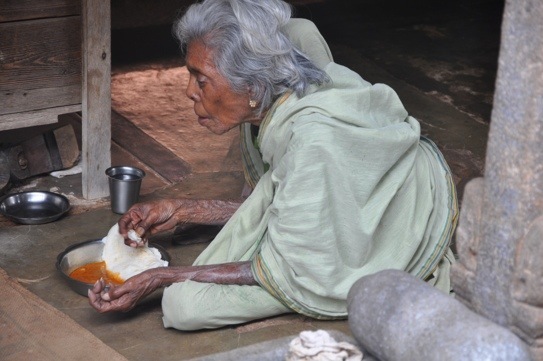 The old families could no longer afford to maintain the great manors and country estates. So the UK set up a national trust to buy them and lease back some small part to serve as living quarters. To generate revenue they would be open to tourists. During time when we lived there, I remember seeing several individuals who had some title or another and no longer dressed in black tie and tails, working the entrance way collecting the fees from the common folk!